A team of medical missioners including TWU professor Nola Schrum, RN, MS, CCRN pose for a picture in Kenya before heading off to work. Walking through the dirt streets of Menara, a Kenyan village, Lauren Jones made her way from the clinic to her firsthome visit of the day to see what medical aid she could provide. 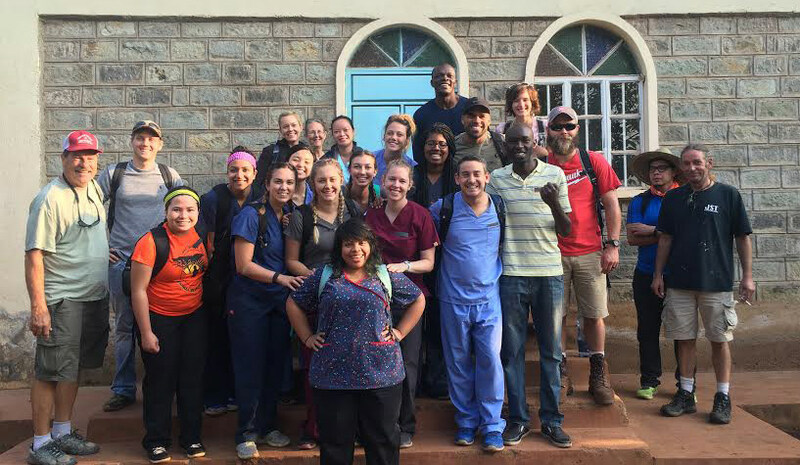 Jones, a senior Nursing student, and ten other nursing students from TWU’s Dallas campus served on a medical mission in Kenya over the summer break. These students decided to serve after hearing about TWU Dallas professor Nola Schrum’s organization, Bless the Children African Missions. Working in teams, the medical missioners ran clinics in a central location and dispatched personnel to visit villagers in their homes accompanied by translators. Jones and her classmates encountered villagers with dehydration, HIV and AIDS, hypertension, dermatitis, intestinal worms, arthritis, infected cuts and impaired eye sight among other ailments. Jones explained that only villagers with money to spare or who had extreme medical problems, such as a stroke, were able to seek medical attention throughout the year when a clinic did not provide free care, leaving some villagers to sufferfrom tooth aches or stomach pains for years. TWU’s team of medical missioners were also given the opportunity to visit an orphanage in the Kisumu slum for children three to 14 years old living with HIV and AIDS. Schrum explained Jones and her peers from TWU demonstrated excellent nursing skills while working in Kenya.